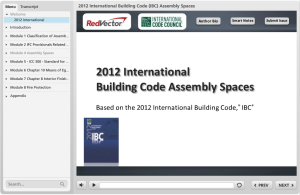 RedVector is happy to announce the launch of a brand new mobile-ready eLearning course – International Building Code (IBC) – Assembly Spaces! This RedVector course was developed in conjunction with the International Code Council (ICC). The course addresses the 2012 International Building Code® (IBC®) requirements applicable to the design and construction of assembly spaces. It demonstrates the differences between the various Group A occupancies and how assembly uses may also fit within the business or educational occupancy classifications. The course covers the unique aspects of the code related to assembly uses including the ICC 300 Standard for Bleachers, Folding and Telescopic Seating and Grandstands, and the special egress provisions of Section 1028. International Fire Code® (IFC®) provisions related to places of assembly such as requirements for a fire watch, limitations on open flames, combustibles and finishes will also be addressed. RedVector is excited about the launch of this mobile-ready International Building Code course and has several other new courses coming soon. Be sure to follow our blog and check us out on Facebook and Twitter to stay up-to-speed on all the latest eLearning news and course launches!